SANYA, HAINAN, CHINA / ACCESSWIRE / April 16, 2019 / The 3rd China Culture & Tourism Industry Annual Conference and Award Ceremony, which lasted from April 11 to 12, 2019, was successfully concluded at Atlantis Sanya, Hainan Province. Supported by Sanya Municipal People's Government, the conference was hosted by New Lvjie, co-organized by the Bureau of Tourism, and Culture, Radio, Sports of Sanya Municipality, and guided by China Tourism Academy. Themed in 'New Landscape, New Potential, New Trend', the conference served as a platform for industrial leaders to exchange ideas and share new opportunities for culture and tourism development in China through dialogues, case analysis, topic seminars, etc. More than 800 industrial leaders from corporative in culture and tourism industries, tourism authorities at all levels, listed tourism companies, famous tourism scenic spots, tourism industry funds, financial institutions, and news media attended the conference. To better inform the decision making of all people in the culture and tourism industry, the conference also released the Reseach Report on China Culture and Tourism Investment and Funding 2018. Developed by New Lvjie Institute together with Juyuan Capital, Davost Yiguang Tourism Industry Fund, and the Tourism Science School of Beijing International Studies University, the report reviewed 295 investment and funding events in the culture and tourism industry in 2018, analyzed and interpreted typical investment cases and investment institutions. At the meantime, the conference also announced the New Lvjie Value Index for 2019. During the annual conference, a private seminar on the tourism development of Sanya, participated by 80 specially invited guests from the industry, was also held to discuss the development of Sanya's culture and tourism industry as well as the investment and funding trend, opportunities and risks. 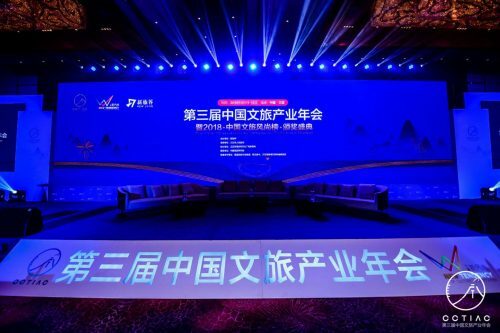 'China Culture & Tourism Annual Conference' is an annual brand event by New Lvjie, the leading culture and tourism business advisory institution, as well as a grand annual conference for China's culture and tourism industry. Started from 2016, it was firstly held in Beijing and then in Xi'an. The Research Report on China Culture and Tourism Investment and Funding, New Lvjie Value Index and China Culture and Tourism Trend Ranking that are released amid the conference, with great industrial influence, appeal and authority, have become iconic annual events and indicators for the culture and tourism industry in China.